I know a LOT about nootropics. 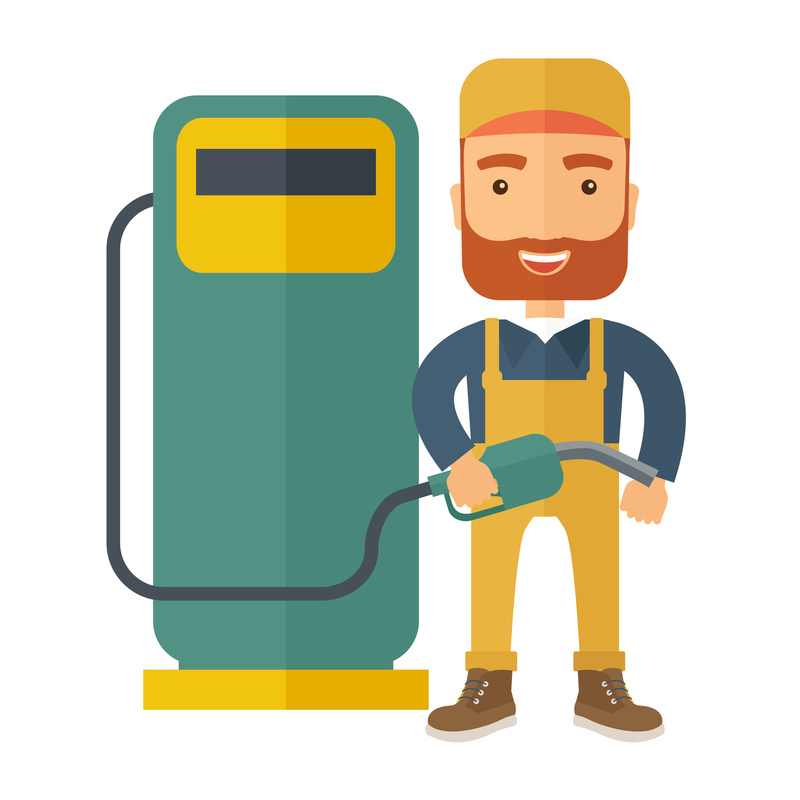 The phrase “well-oiled machine” applies to brain health just as much as it does to metallic machinery–however that doesn’t mean you should attempt guzzling motor oil, nor should you fill your car with olive oil. Without a proper oily brain, cognition declines. And if you think I’m speaking metaphorically, I’d advise you to check out Brain Octane Oil, which quite literally provides oil for your brain to operate properly. That is, assuming you have a brain. In the opposite case, I can’t imagine this review helping you too much. Who Takes Brain Octane Oil? 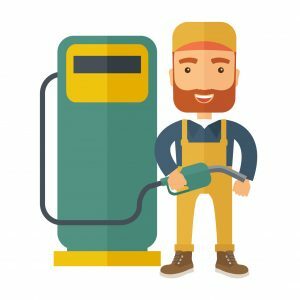 Conclusion: Does Brain Octane Oil Work? Made by Bulletproof, the Silicon Valley company that brought us Bulletproof Coffee, Brain Octane Oil is an ingredient that incidentally goes great with Bulletproof Coffee. Caprylic acid is the fatty acid of this oil, a fatty acid believed to aid long-term cognitive function with therapeutic potential in the later years of age-related cognitive decline. Why Brain Octane Oil over simple coconut oil? The claim: Brain Octane Oil is 18 times more potent than regular coconut oil. Directions: Start by using one teaspoon at a time and increase slowly over several days to one or more full servings (1 tablespoon) daily. Too much Brain Octane, especially on an empty stomach, can result in disaster pants (gastric upset). Brain Octane can be consumed anytime of the day. 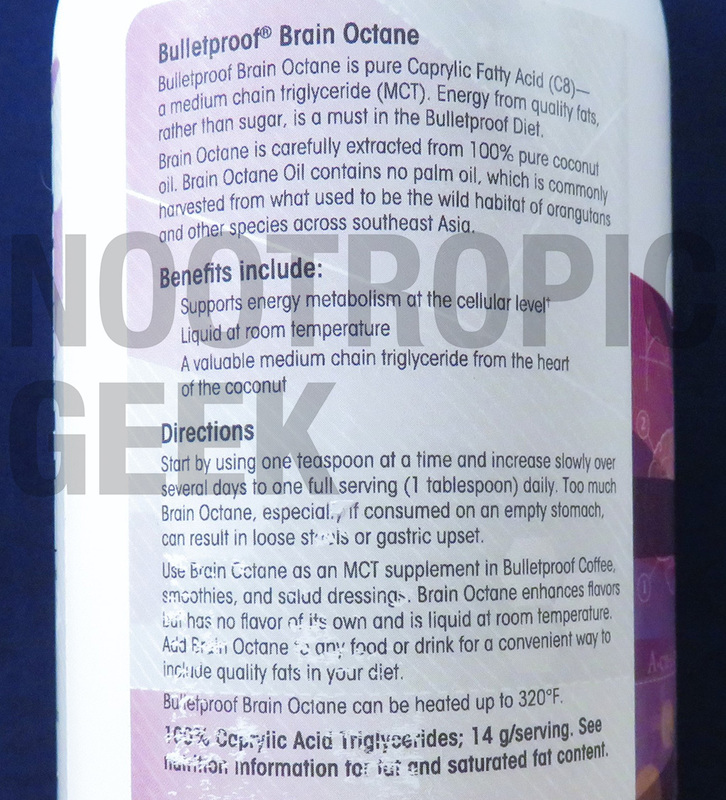 Use Brain Octane as a supplement in Bulletproof Coffee™ or in tea, smoothies, and salad dressings. Add to any food or drink for an amazing boost. The best way to maximize energy and reach peak performance is to blend Brain Octane with grass-fed butter in a fresh cup of Upgraded Coffee, to make Bulletproof Coffee. 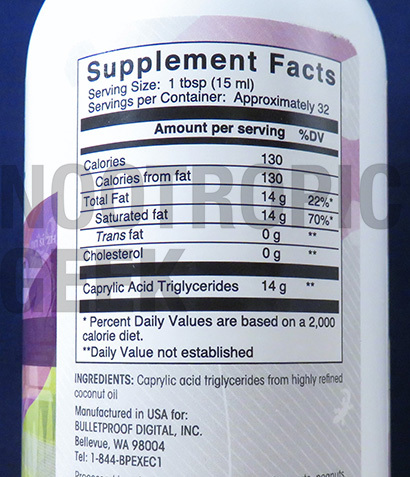 Caprylic Acid (sourced from coconut and/or palm kernel) – 8-carbon medium-chain triglyceride sourced from, well… you can read. This particular fatty acid is believed to improve cognitive energy, clear brain fog, & support long-term brain health. Popular theory dictates that adding coconut oil to the diet (the trend specifies adding it to coffee) may help improve cognitive longevity, while promoting an increased metabolism for increased fat burning. Therefore, if Brain Octane Oil is 18 times more potent than coconut oil, then it should work up to 18 times better than coconut oil, right? That’s the idea behind this brain health product, which is more additive than supplement for its almost condiment-style usage: Add a squirt to your food or drink, and BLAM! Time to pump up that little brain of yours! Suddenly you’re a ripped genius. Except not really. That’s not the intent of this oil, nor is it really advertised as such. Rather, Brain Octane Oil supplies a quality source of brain & body “fatty” fuel that may help support & sustain mental & physical performance for the long-run. It’s a relatively cheap & potent source of caprylic acid, which has been shown in clinical research to assist with cognitive disease states. But how does it work under non-impaired cognitive states? How does caprylic acid affect mild cognitive disorder? It’s really hard to say, which is why the whole cognition enhancing coconut oil theory is rather contentious among certain health communities. Some think the therapeutic attachment to the fatty acids is bogus. Others refer to it as simply good nutritional practice. What do I think? 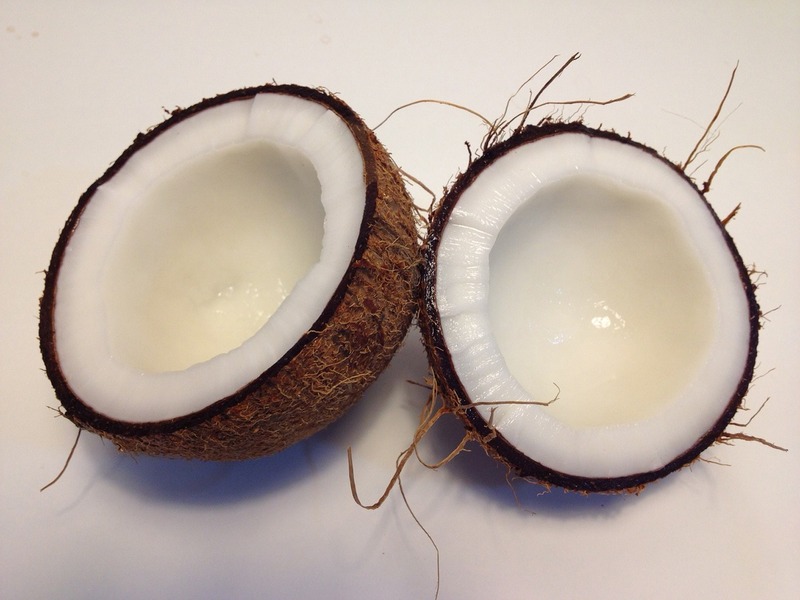 Coconut oil supplementation is underrated, namely because the results aren’t immediately evident. Taken over time it makes sense that mental & physical health would improve over an otherwise diminished state, given the importance of fatty acids to neuronal health. Perhaps this means coconut oil is simply good nutrition, but Brain Octane Oil seems to be even gooder nutrition for supplying a (reportedly) highly potent source of these fatty acids. Plus, it’s a cheap & easy practice. Personally, it makes me feel good, and I like feeling good. Coconut-derived oil is an easy positive dietary addition to make, especially for coffee drinkers who can mix the oil with butter for the true Bulletproof experience. While I’m not too sure about the “18 times more potent” claim, Brain Octane Oil reads like a more premium, potent form of caprylic acid. Coffee is expensive enough, but an additional $0.73 per cup is not too much, considering the long-term brain benefits involved. The science doesn’t point to caprylic acid as being a powerful cognitive enhancer. As such, it may not offer any immediately significant nootropic bio-benefits. Overall, the science can be a little muddy on coconut oils, so an element of faith must be depended on while supplementing Brain Octane Oil. Bulletproof claims the oil is “very different from coconut oil” before labelling the product as “100% coconut-derived.” The phrase “very different” is thus misleading, but so is “100% coconut-derived,” because the oil is partly sourced from palm kernal. Get it together, guys. 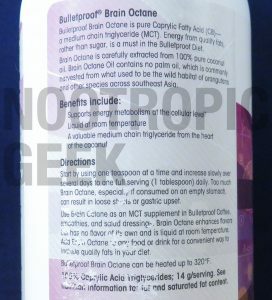 Brain Octane Oil reads like a supplement that becomes more & more valuable over time (i.e. as you age). The marketing gives off major Silicon Valley vibes, so I can see this being a hit among all the coffee shop techie hipsters (à la Bay Area, CA). 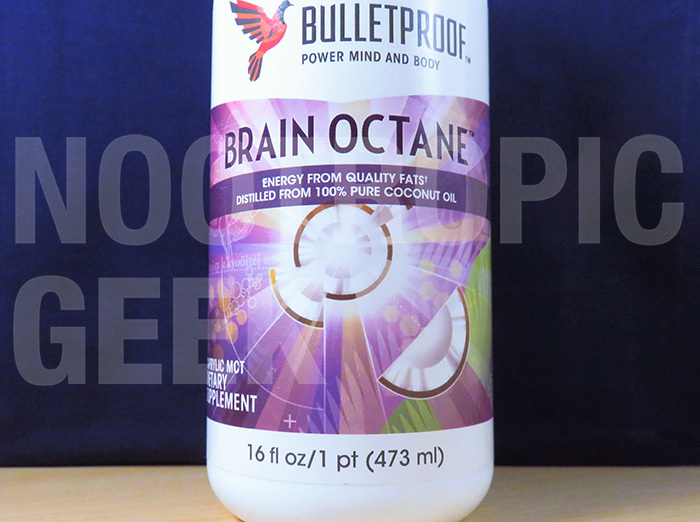 Brain Octane Oil is sold directly through Bulletproof as well as other various online retailers. If you claim it works, you believe in coconut oil. If you claim it doesn’t work, you don’t believe in coconut oil. Personally, I like the stuff. Those coffee shop techie hipsters I made a slight jab at? Guess what: I’m one of them. And I’m such a hipster that I go for the full Bulletproof stack, butter & everything, when I toss coconut oils into my coffee. I like the chances of it working, plus who doesn’t like butter & oil? Whether or not you believe in coconut oil, caprylic acid still shows some promising research in certain areas of brain & bodily health. As such, it seems like an easy, cheap supplement to up your chances on the good life. And I, like, really like the good life.